Social medias provide everyone a range of benefits, and opportunities for empowerment. It helps in maintaining social connections and support networks, and can access more information than ever before. The communities and social interactions young people form online can be invaluable for bolstering and developing young people’s self-confidence and social skills. Strange things have been happening in the news lately. Already this year, members of US President Donald Trump’s administration have alluded to a ‘Bowling Green massacre’ and terror attacks in Sweden and Atlanta, Georgia, that never happened. The misinformation was swiftly corrected, but some historical myths have proved difficult to erase. Since at least 2010, for example, an online community has shared the apparently unshakeable recollection of Nelson Mandela dying in prison in the 1980s, despite the fact that he lived until 2013, leaving prison in 1990 and going on to serve as South Africa’s first black president. Collective memories form the basis of history, and people’s understanding of history shapes how they think about the future. The fictitious terrorist attacks, for example, were cited to justify a travel ban on the citizens of seven “countries of concern”. Although history has frequently been interpreted for political ends, psychologists are now investigating the fundamental processes by which collective memories form, to understand what makes them vulnerable to distortion. They show that social networks powerfully shape memory, and that people need little prompting to conform to a majority recollection — even if it is wrong. Not all the findings are gloomy, however. Research is pointing to ways of dislodging false memories or preventing them from forming in the first place. To combat the influence of fake news, says Micah Edelson, a memory researcher at the University of Zurich in Switzerland, “it’s important to understand not only the creation of these sites, but also how people respond to them”. Communication shapes memory. Research on pairs of people conversing about the past shows that a speaker can reinforce aspects of an event by selectively repeating them1. That makes sense. Things that get mentioned get remembered — by both speaker and listener. There’s a less obvious corollary: related information that goes unmentioned is more likely to fade than unrelated material, an effect known as retrieval-induced forgetting. These cognitive, individual-level phenomena have been proposed as a mechanism for memory convergence — the process by which two or more people come to agree on what happened. But in the past few years, clues have emerged that group-level forces influence convergence, too. In 2015, psychologists Alin Coman at Princeton University in New Jersey and William Hirst of the New School for Social Research in New York City reported that a person experiences more induced forgetting when listening to someone in their own social group — a student at the same university, for example — than if they see that person as an outsider2. That is, memory convergence is more likely to occur within social groups than between them — an important finding in light of survey data suggesting that 62% of US adults get their news from social media, where group membership is often obvious and reinforced3. Groups can also distort memories. In 2011, Edelson, then at the Weizmann Institute of Science in Rehovot, Israel, showed 30 volunteers a documentary. They watched the film in groups of five and, a few days later, answered questions about it individually. One week after the viewing session, participants answered questions again — but only after seeing answers that members of their group had supposedly given. When most of the fabricated responses were false, participants conformed to the same false answer about 70% of the time — despite having initially responded correctly. But when they learnt that the answers had been generated randomly, the participants reversed their incorrect answers only about 60% of the time4. “We found that processes that happen during initial exposure to erroneous information make it more difficult to correct such influences later,” says Edelson. Studying those processes as they happen — as collective memories are shaped through conversation — has been difficult to do in large groups. Five years ago, monitoring communication in groups of ten or more would have required several rooms for private conversations, many research assistants and lots of time. Now, multiple participants can interact digitally in real time. Coman’s group has developed a software platform that can track exchanges between volunteers in a series of timed chats. “It takes one research assistant 20 minutes and one lab room,” Coman says. 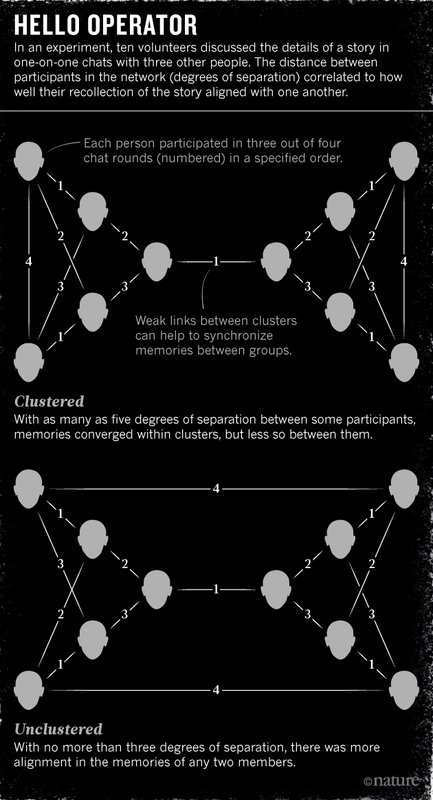 Last year, the group used this software to ask, for the first time, how the structure of social networks affects the formation of collective memories in large groups. The researchers fed information about 4 fictional Peace Corps volunteers to 140 participants from Princeton University, divided into groups of 10. First, the participants were asked to recall as much information as they could on their own. Then, they took part in a series of three conversations — online chat sessions lasting a few minutes each — with other members of their group, in which they recalled the information collaboratively. Finally, they tried to recall the events individually again. The researchers investigated two scenarios — one in which the group formed two sub-clusters, with almost all conversations taking place within the sub-clusters, and one in which it formed one large cluster (see ‘Hello operator’). Although people in the single cluster agreed on the same set of information, says Coman, those in the two sub-clusters generally converged on different ‘facts’ about the fictional volunteers5. This effect is evident in real-world situations. Palestinians living in Israel and those in the West Bank, who were separated by force during the Arab–Israeli wars of 1948 and 1967, have gravitated to different versions of their past, despite a shared Arab–Palestinian identity6. Similarly divergent truths emerged after the erection of the Berlin Wall. In the lab, Coman can manipulate social networks and look at the memories that form. His comparison of the two scenarios revealed the importance of ‘weak links’ in information propagation. These are links between, rather than within, networks — acquaintances, say, rather than friends — and they help to synchronize the versions held by separate networks. “They are probably what drives the formation of community-wide collective memories,” he says. One function of those weak links might be to remind people of information expunged through the processes of memory convergence. But timing is important. In unpublished work, Coman has shown that information introduced by a weak link is much more likely to shape the network’s memory if it is introduced before its members talk among themselves. Once a network agrees on what happened, collective memory becomes relatively resistant to competing information. Coman thinks that memory convergence bolsters group cohesion. “Now that we share a memory, we can have a stronger identity and might care more about each other,” he says. Abundant research links strong group identity with higher reported individual well-being. This is shown by research on the family. At Emory University in Atlanta, Georgia, psychologist Robyn Fivush is studying the stories that families tell themselves. “What we find is that adolescents and young adults who know more family stories show better psychological well-being,” she says. Although shared memories may foster more-closeknit groups, they can also distort the role of outsiders, driving a wedge between groups. Memory shapes group identity, which in turn shapes memory, in a potentially vicious cycle. Weak links have an important corrective effect, but in their absence, two groups might converge on mutually incompatible versions of the past. These may be preserved for posterity in statues and history books. But they can evolve over time. In Ostend, Belgium, a public monument depicts the Belgian king Leopold II, surrounded by two groups of grateful subjects — one Belgian, the other Congolese. In 2004, protesters, who felt that the monument misrepresented history, severed the bronze hand of one of the Congolese figures. They explained anonymously to a local newspaper that the amputation more accurately reflected Leopold’s role in Belgium’s African colony: not genial protector, but brutal tyrant. Not all collective memories pass into history. Cognitive psychologists Norman Brown of the University of Alberta in Edmonton, Canada, and Connie Svob of Columbia University in New York City have proposed that something besides cognitive and social processes determines whether an event survives the transition across generations: the nature of the event itself. “It is the amount of change to a person’s fabric of daily life that is most crucially at stake,” says Svob. In a study published last year8, they reported that the children of Croatians who had lived through the Yugoslav wars of the 1990s were more likely to recall their parents’ war-related experiences — getting shot, for example, or the house being bombed — than their non-war-related ones, such as marriage or birth of a first child. Wars, like immigration, bring great upheaval in their wake, and so are highly memorable, says Svob. The set of collective memories that a group holds clearly evolves over time. One reason for this is that people tend to be marked most by events in their adolescence or young adulthood — a phenomenon known as the ‘reminiscence bump’. As a new generation grows up, events that happen to its members during their youth override the events that previously dominated society, and thus ‘update’ the collective memory. A 2016 survey by the Pew Research Center in Washington DC showed that the defining historical moments for baby boomers in the United States were the assassination of John F. Kennedy and the Vietnam War, whereas for those born since 1965, they were the terror attacks on 11 September 2001 and the election of former US president Barack Obama9. And over time, each generation adds some events and forgets others. Psychologists Henry Roediger of Washington University in St. Louis, Missouri, and Andrew DeSoto of the Association for Psychological Science in Washington DC report, for example, that successive US generations forget their past presidents in a regular manner that can be described by a power function10. They predict that Harry Truman (1945–53) will be as forgotten by 2040 as William McKinley (1897–1901) is today. That evolution is reflected by evolving attitudes towards the future. Roediger and anthropologist James Wertsch, also of Washington University, have observed that US politicians debating the invasion of Iraq in the early 2000s fell into two groups: those who advocated invasion on the grounds that Saddam Hussein had to be stopped like Adolf Hitler before him, and those who opposed it because they feared another bloody, protracted Vietnam War. Although each might have chosen their historical precedent for political reasons, they in turn reinforced that precedent in the memory of anyone who heard them speak. Coman has two suggestions from his findings. The first is directed at the justice system. In some US states, jurors are forbidden to take notes made during a trial into the deliberation room — a legacy of historically high illiteracy rates and a belief that the group remembers more reliably than the individual. In fact, says Coman, using notes could protect jurors from retrieval-induced biases and group-level social influences. His group is hoping to explore the impact of such rules in more depth. His second suggestion concerns the diffusion of crucial information to the public during emergencies such as epidemics. Having observed that retrieval-induced forgetting is enhanced in high-anxiety situations, he has come up with some advice for officials: draw up a short but comprehensive list of key points, make sure that all officials have the same list, repeat those points often and keep tabs on bad information that enters circulation. During the 2014 Ebola outbreak, for example, concerns in the United States were stoked by a misconception that being in the same room as a person with the infection was enough to catch it. The best way to kill that rumour, Coman says, would have been to explain — often — that Ebola could be transmitted only through bodily fluids. “If you understand the nature of the false information, you can target it for suppression just by mentioning information that is conceptually related but accurate,” he says. Collective memory is a double-edged sword. Some will no doubt use it to mislead. “The fact that information can freely circulate in the community has been considered one of the most important and constructive features of open and democratic societies,” Coman says. “But creating such societies does not inherently guarantee positive outcomes.” False collective memories might be the price of defending free speech. But understanding how they form might offer some protection the next time people are reminded about a massacre that never happened.